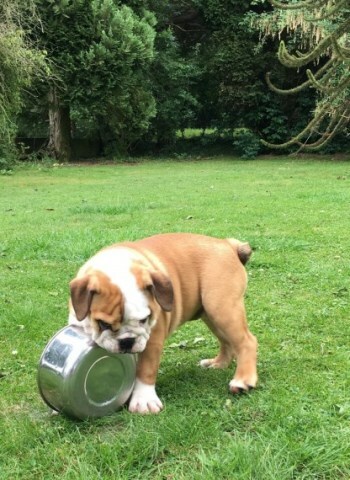 We have 2 stunning healthy chunky Bulldog puppies available for sale. Sired by: BEMOJO GLORY BE ICEGLINT (HUU CLEAR). Dam: BULLENCA TIGER LILLY AT WANETA (CH. KINGROCK CAPTAIN COOK DAUGHTER) & litter sister to (CH. BULLENCA FIRECRACKER). Dam is Bronze Bulldog Breed Council Health Tested. Both parents have excellent pedigrees. Our puppies are raised in the home with other dogs and cats and so are well socialised. Both puppies are fully vaccinated and ready to leave to go to their 5 star forever homes. Fully vet checked, microchipped, KC registered with 5 generation KC pedigree certificate together with 2 weeks free insurance. Fully wormed & flead to-date, 'leaving home' pack including blanket & toys. Full dietary & advice sheets. All enquiries welcome including show/breeding. READY TO GO NOW. E-mail photos available upon request.